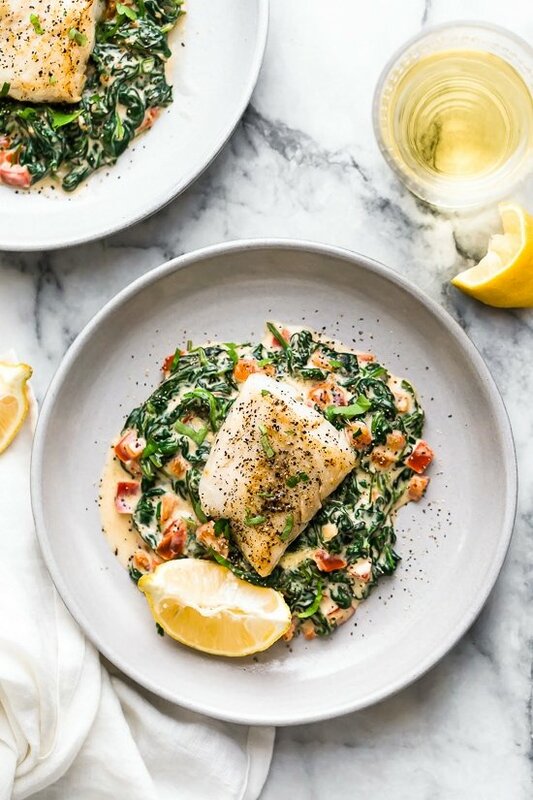 This easy Fish Florentine recipe, made with a pan seared firm white fish served on a creamy bed of spinach feels like something you would order out in a fancy restaurant! I love fish and try to eat it once or twice a week. 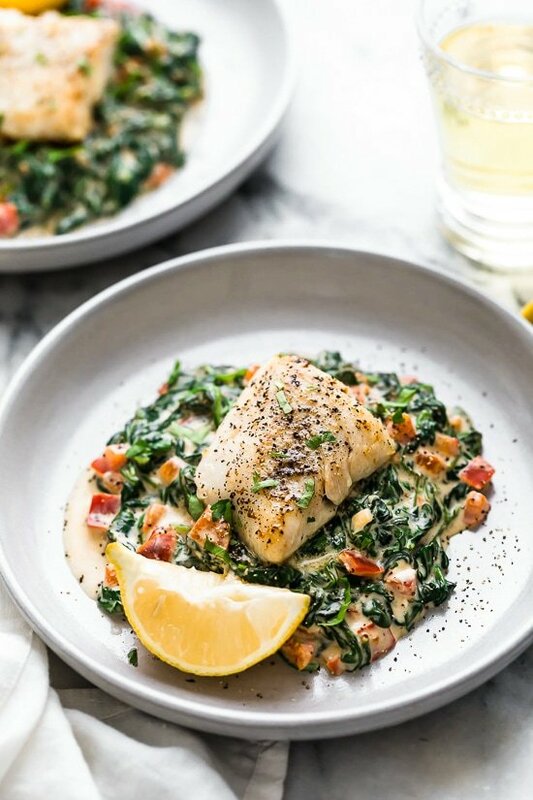 You can see all my fish recipes here! 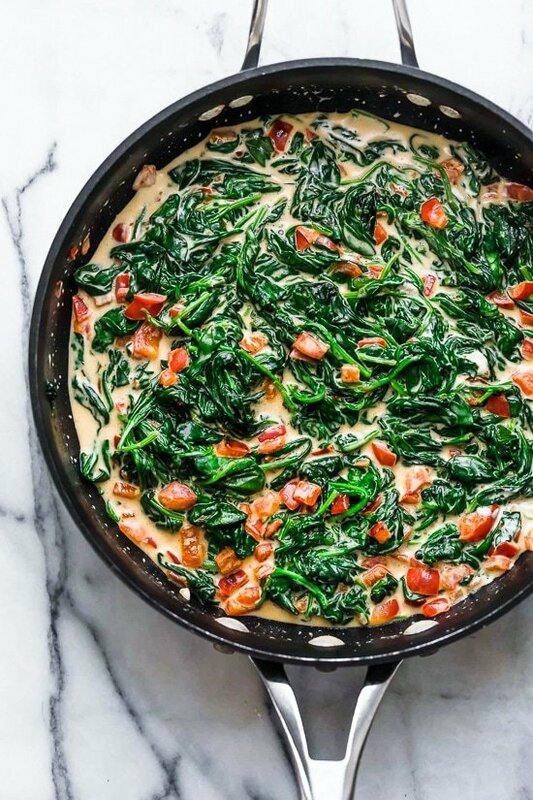 This recipe takes under 30 minutes to make, the creamy spinach is what makes the whole dish, made with a little cream cheese, half & half cream and Parmesan cheese. 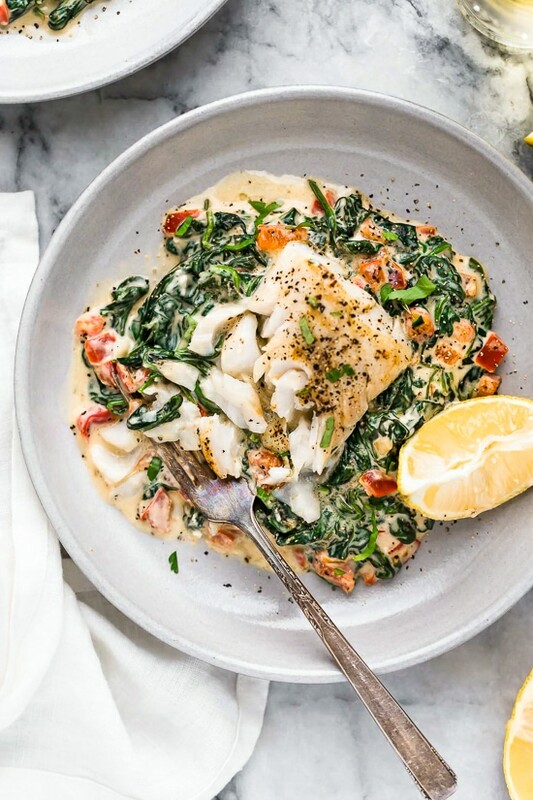 It’s dreamy, delicious and the perfect pairing for the simple white fish. I adapted this dish from this recipe I found online, which I lightened up simply by reducing the butter, oil, Parmesan and cream cheese. I had reduced-fat cream cheese on hand so I used that instead and it turned out amazing! Rich and decadent and feels like it should be a lot more calories! Any firm, white boneless fillet would be great, I usually choose local and ask my fishmonger for the freshest options available. Here I used cod, but halibut, or sea bass would make a great option. 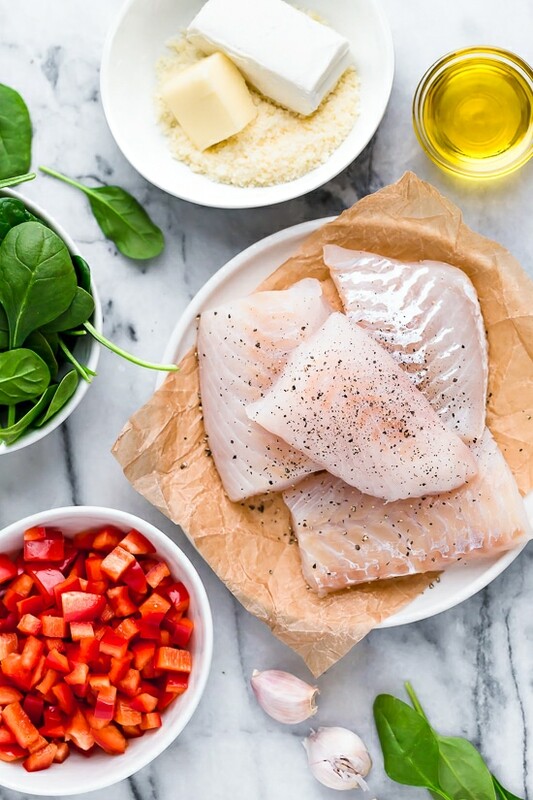 If you use a thinner piece of fish, you will want to adjust the cook time so you don’t over-cook it. If fresh fish is available, wait until the day or day before to buy it before you are going to cook it. If fresh isn’t available, buy frozen instead of previously frozen so you can control freshness and keep it frozen until you need it. 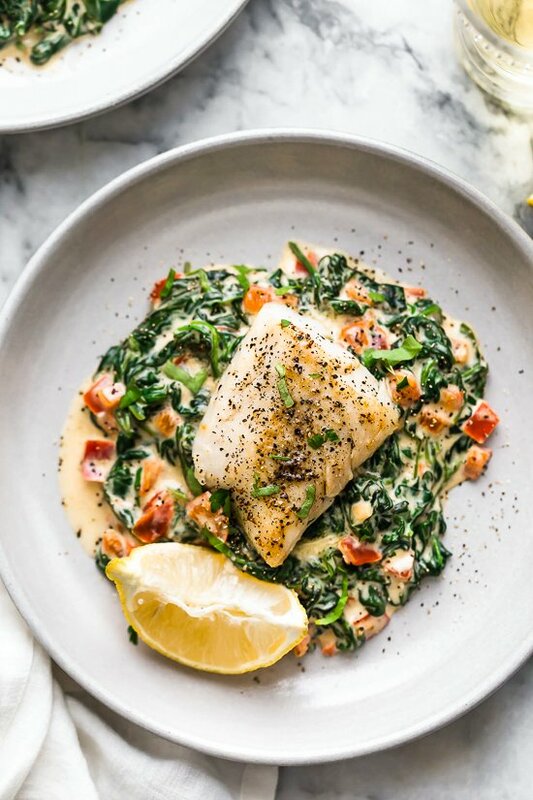 Swap the fish for chicken breast, scallops or shrimp if you’re not a fan of fish. In a large skillet over medium heat add 1/2 tablespoon of olive oil and 1/2 tablespoon of butter, red bell pepper and garlic and cook for about 4 minutes. Add spinach season with a pinch of salt and pepper mix until the spinach wilts down. 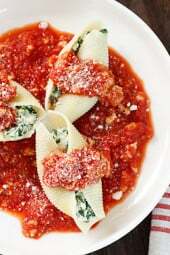 Add cream cheese, half & half and parmesan cheese mix well until cream cheese is melted and resembles creamed spinach. Heat a separate skillet on medium high heat, add remaining oil and butter. Season fish on both sides with salt and pepper and place on the hot pan. Cook 6 minutes on first side and flip fish over and cook other side an additional 5 minutes, until cooked through and browned. Divide the spinach mixture on the bottom of each plate and top with piece of fish. 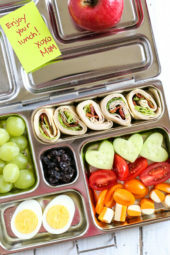 Hi Gina, Love all your recipies! I was just wondering, would it be ok to use FF Half & Half in this recipe? Yup, it’s a hit for sure and here’s why – it’s delicious, easy to make and looks very fancy. First time I made it with Alaskan Cod and just made it again with chicken breast. Hubby adds brown rice but I skip that to keep it within the 6 FS points. Very filling. This is a must!!! I can’t eat bell peppers, any suggestions for alternatives? Grape tomatoes maybe? Delicious!! Will try it with chicken as well, because anything on top of that wonderful spinach is sure to be good. Want to try this, but would be making it for 2. So I guess I would use half the butter, oil, cream cheese and half and half. Made this last night. Absolutely delicious and very easy to make!Had a very rich and creamy flavor. Husband is not a huge white fish lover and he enjoyed it as well. This recipe was absolutely delicious! My bf also raved about it . Since I’m on keto, I served it as is. It was also very easy. 5 stars !! This will be going into my weekly rotation. Can anyone tell me which points we track for WW? If it says 6 freestyle points +9 is it 9 that we track? I appreciate anyone’s help. Hi Stephanie. It is 6 FS points and it is 9 points plus, which is an older WW program. If you are following freestyle it is 6. This recipe was amazingly decadent!! My husband can’t believe this is part of our healthy eating plan. It seems too rich and delicious! 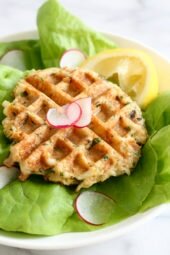 Gina, your recipes have helped me stay with my WW plan for longer than I ever believed possible. I am delighted with every recipe I’ve tried. Just purchased your One and Done Cookbook and think I’ll buy an Insta-Pot too since you love yours so much. Thank-you for the awesome recipes!! Outstanding & Easy! Very impressive dinner! I LOVE your recipes and this one is on top of the list for me. 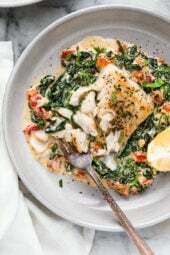 I am thinking to make Fish Florentine for larger crowed (12people). Do you have any suggestion how to keep it warm for serving at dinner if I make it 2-4 hours earlier? Thank you! Made this recipe tonight. It was beyond amazing. I tweaked it little by adding some shrimp but oh my it was delish!! Amazing!! This is my third time making it in the past month or so!! Keep the awesome recipes coming. You are such a blessing! I only know how to make salmon, but I’ve wanted to eat more fish. 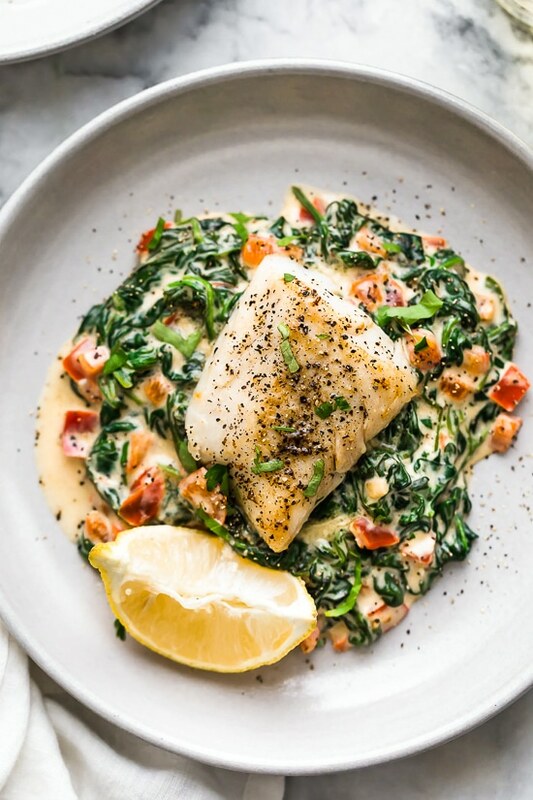 Halibut was on special and this recipe was so fast, easy and delicious. I’m not a huge fan of really rich dishes, but because of the minimal amount of cream and cheese, I thought it tasted luscious but noy overly rich. My husband thought it was loaded with butter. He couldn’t believe there was less than a tablespoon in the whole recipe! Will definitely make again. This is THE BEST fish recipe. It is easy, cooks quickly and is a huge hit with my family. I’m going to try it with shrimp and scallops as someone suggested. . 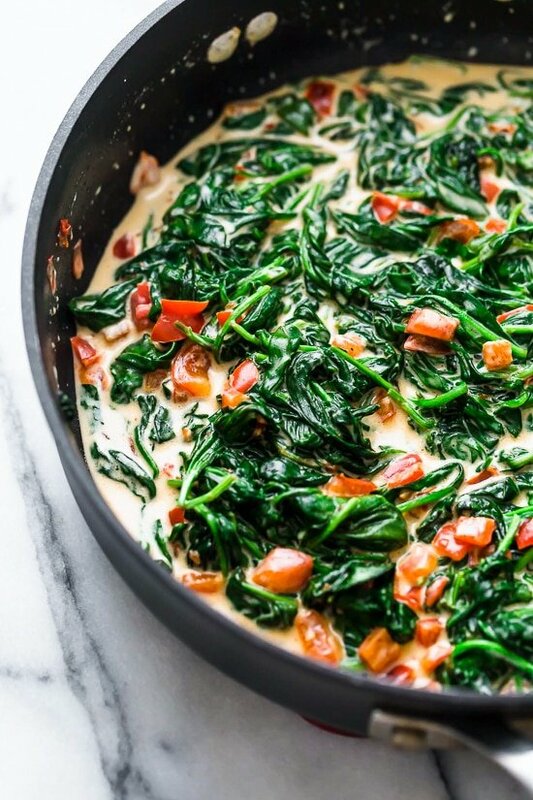 I use a lot more spinach as we love it too. Wow!! This is definitely a new family favorite! Thanks so much for the recipe.